AMMONNEWS - A German World War I hand grenade was found among a shipment of French potatoes imported for a Hong Kong crisp factory, police said. The device was safely detonated after it was discovered at the Calbee snacks factory Saturday. “The grenade was in an unstable condition because it has been previously discharged but failed to detonate,” Superintendent Wilfred Wong Ho-hon told reporters. Police detonated it on site, Wong said, with a police video showing bomb disposal officers packing the grenade in a drainage channel at the factory before blowing it up. The grenade was eight centimeters wide and weighed about one kilogram. “All the information to date suggested that the grenade was imported from France together with the other potatoes,” Wong said. 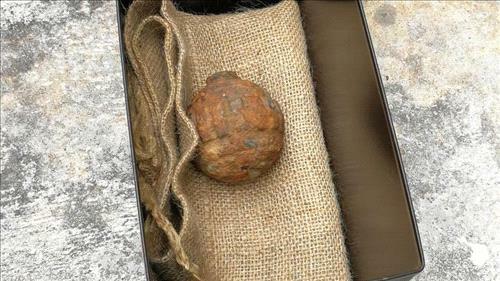 The grenade is believed to have been left in a trench during World War I and accidentally gathered up with potatoes planted a century later in the former battlefield. “If it was covered in mud, the grenade was likely to have been left behind, dropped by soldiers there during the war, or left there after it was thrown,” Hong Kong University military historian Dave Macri told the South China Morning Post. Hong Kong police are used to dealing with old munitions, though more usually US bombs dropped on the city after it fell to the invading Japanese during World War II. Last year the bomb disposal squad defused three large WWII bombs, two of which were found at a site in the busy Wanchai district where work was underway to build a new metro railway station. Unexploded wartime bombs or grenades are frequently found by hikers or construction workers in the southern Chinese city, which was the scene of fierce fighting between Japanese and British allied forces in 1941. The then-British colony was heavily bombed by US and allied forces after the city fell to the Japanese imperial forces.